Apparently this is a book blog now, because a solid 50% of my posts these days are just book reviews. I’ve been reading a lot. Can you tell? 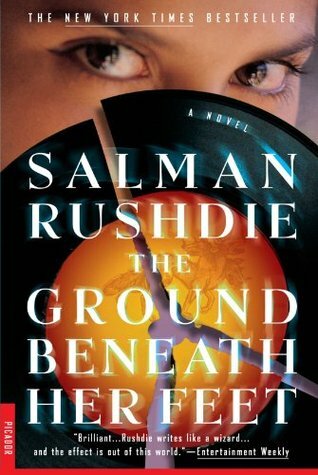 Today the book is The Ground Beneath Her Feet by Salman Rushdie, an author whom my good friend Emily simply worships, but whom I have taken some time to warm up to. I originally tried to read The Satanic Verses back in middle school when she was enthusing about it, but checked out halfway through the first chapter, declaring it unreadable. In retrospect, I may have been a bit below the necessary reading level on that one. After reading (& loving) Haroun and the Sea of Stories a couple years back, I’ve been meaning to give Rushdie another shot, and finally got around to it. Guys, The Ground Beneath Her Feet is absolutely spectacular. Before I tell you what this book is about, I should warn that it is long. Like, really long. Like, The Years of Rice and Salt long. Actually, Ground Beneath Her Feet has a lot in common with Years of Rice and Salt, and not just the unwieldy titles. Both are alternate histories rooted in eastern religions, with an attention to detail that’s so immaculate as to be mind-boggling. In both cases, the amount of research that must have gone into them is staggering. The Ground Beneath Her Feet is the story of Vina Aspara and Ormus Cama, rockstar lovers with god-like musical abilities and a complete inability to handle interpersonal relationships in anything approaching a reasonable and mature manner. Telling the story is Rai, a photojournalist and Vina’s secret lover (as opposed to all of the public ones, of which there are thousands), and also a complete shithead in all of the most entertaining ways. Rai is my favorite unreliable narrator ever. The book follows these three people through their drama-filled, intertwined lives as they move through and out of Bombay, London, and New York, featuring a host of side characters with fascinating and sometimes sick stories of their own. Meanwhile, as their Earth diverges from our own, Ormus begins to see into a parallel world, which is on a destructive collision course with his own. And all along, the tale of Ormus and Vina is compared and contrasted with epic myths from the Greek and Hindu traditions, particularly that of Orpheus and Eurydice, lending the story an epic feel. The end result is a book with so many different plot threads it ought to be a complete mess, but Rushdie weaves them together with just the right balance, making it not only possible, but actually easy to keep everything and everyone straight. I can remember only one occasion on which I was confused about who a character was when he re-appeared, and then only briefly; that’s quite a feat for a 500+ page book. Occasionally the prose gets a little weighed down under all that detail, and Rai is so full of himself that his boasting can sometimes interfere with plot momentum, but for the most part it’s an effortless read, especially if you come into it with a base knowledge of Greek myth, the Hindu pantheon, and post-WWII pop culture. If you’re looking for an excellent long-haul read to hunker down with over the summer, definitely pick this one up. Mostly just music–the Beatles, the Stones, the entirety of the hair metal scene. Also to a lesser extent American and Indian politics, but that’s all pretty overt and mostly there to mark divergences between the alternate history and our own.